Big whoop I hear you cry. It just means we will have clearer pictures and sounds on our televisual boxes, with no more snowy interference when the wind decides to rear its ugly, invisible head. But wait. For it will also mean the death of one of my favourite inventions in the history of the world. Okay, maybe that’s a bit much but still, I love it. What am I talking about you ponder? Ceefax. Now is the time for a brief history lesson. 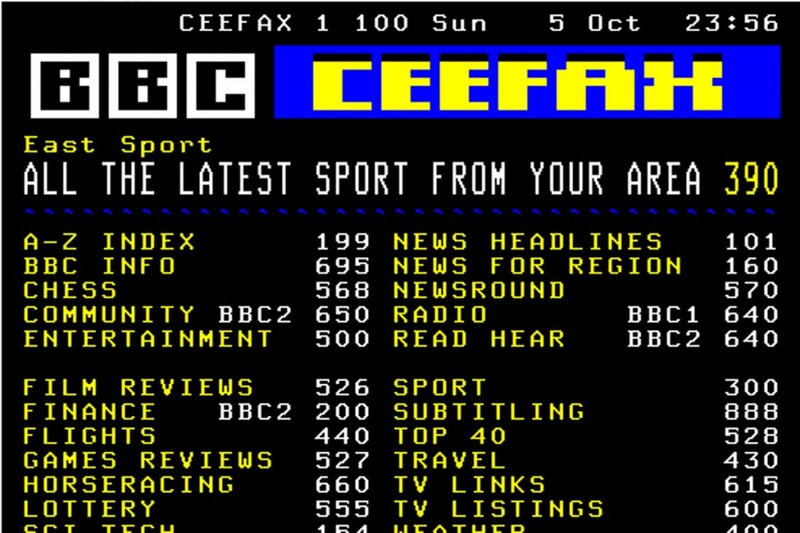 Nominally, Ceefax is the BBC’s teletext service, first invented in 1974 as a way of providing subtitles for deaf viewers. But it soon bloomed, becoming the first beacon for everything from news, sports information, weather, flight arrival times and a million other things in the pre-internet days. On a personal level, I was, and remain, a little bit obsessed by the service, to the degree that I have an OCD-style start to each day and get a little bit itchy and irritable if I can’t carry it out. It goes like this. My first port of call is page 101, the main news headlines. It gives me an overarching view on the world and gives me abreast of any major events – disasters, deaths, quirky stories (page 124 normally). Then we move onto page 160 or for those in the know, Northern Ireland news. This hub gives me access to stuff that while not treated as big enough to be on the ‘main’ news page, nevertheless has an important impact in our wee corner of this island. Now we come to the controversy. Being a football fan, you’d expect I’d head straight to page 302 for the football headlines. But you’d be wrong. For I travel through the forest of pixels and eventually turn up on page 501 for the entertainment news. I know, I know. I’ve rallied against modern celebrity culture and everything it entails in this very column. But I’ve also mentioned I’m a film geek and musical snob, so I need to know what is the latest gossip in each of those worlds. Lionel Messi-like, I skilfully dance around the X-Factor nonsense to find out what the likes of Steven Spielberg is up to. And then, and then, and then. Finally page 302 for the football news, which I can peruse at my leisure, having nowhere else to go in this wonderful blue and white text on a back background. Those readers that haven’t been scared off by my mania will be thinking this all seems out-dated and a little quaint in the modern world, where you can find anything at the touch of a button (or screen in a lot of cases). That’s not even mentioned digital text, where you can press the red button on BBC channels to be sent to what amounts to a digital version of Ceefax. But it’s just not the same. There’s something a little soulless about the whole affair. It’s like asking a music aficionado to listen to a gleaming MP3 version of The White Album as opposed to a vinyl copy, complete with crackling imperfections. I’ve already been dealt a stinging blow with the ending of most of the Teletext (the ITV/Channel 4 equivalent) pages. My OCD was even worse when that service was still about, as I had to do the whole routine again only on a different channel and with different numbers. So to the present. While there may have been huge leaps in medicine, quantum leaps in technology and we’re now only three years off owning the hoverboards from Back to the Future II, if it means there is going to be a world without Ceefax, I’m not sure I want to be a part of it.